NOTE: Be sure you are signed up for our weekly newsletter! We will be sharing an exclusive discount code for Oaki THIS Wednesday only for our newsletter subscribers! 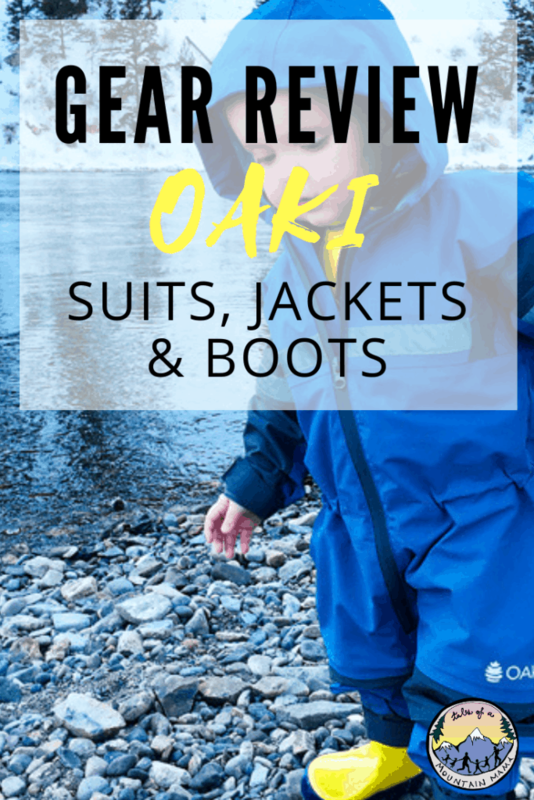 I have long been a fan of Oaki’s affordable and reliable outdoor gear for kids, especially their rain gear. Living in Montana, where we get less than a foot of rain a year, it seems like it wouldn’t come in handy as it has. But between the snow, the mud, and the wind that we do deal with for a good chunk of the year, Oaki’s gear has been perfect. 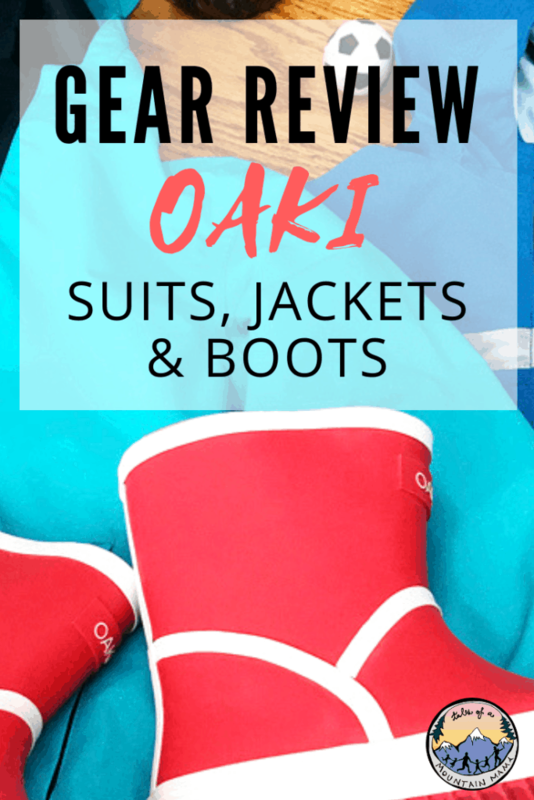 This year, Oaki came out with a new line of rain boots – the Euro Boot. This boot is super lightweight, and shorter than their other rain boots. 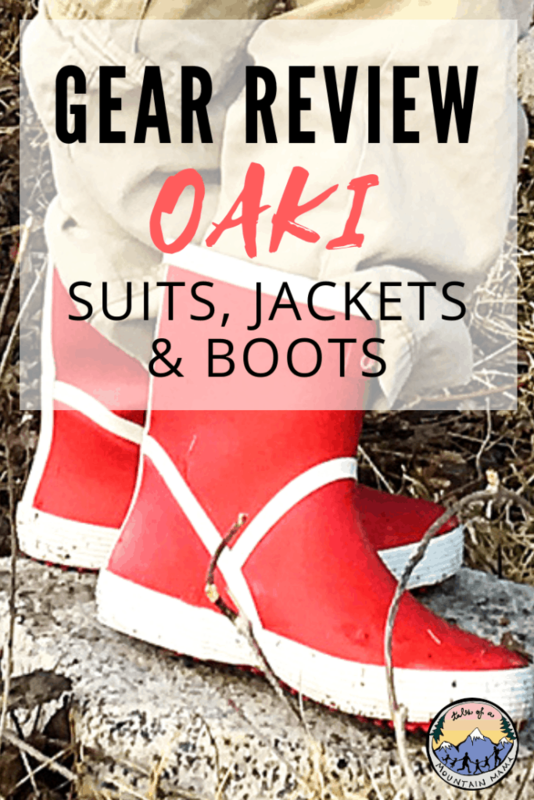 My family put these boots, and a few other Oaki rain products to the test this spring. Our thoughts are below. As always, this review will be updated with further testing this spring, summer and fall. 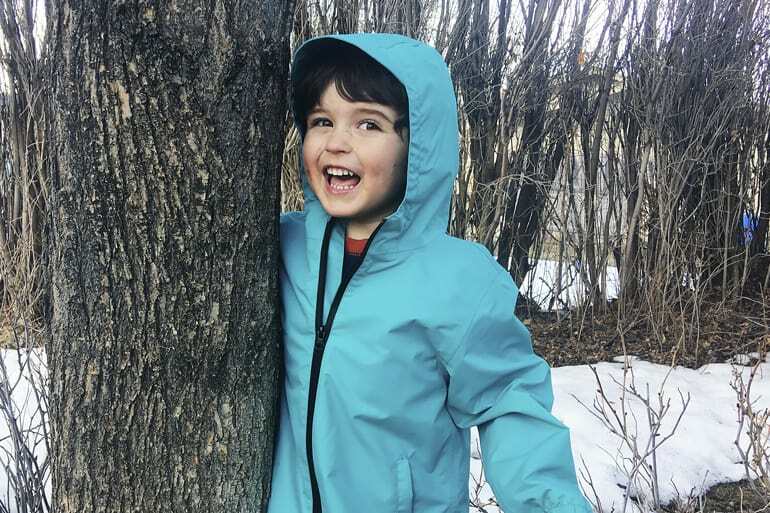 If you are going to be spending any significant amount of time outdoors with a toddler or preschooler, I highly recommend getting a trail suit. 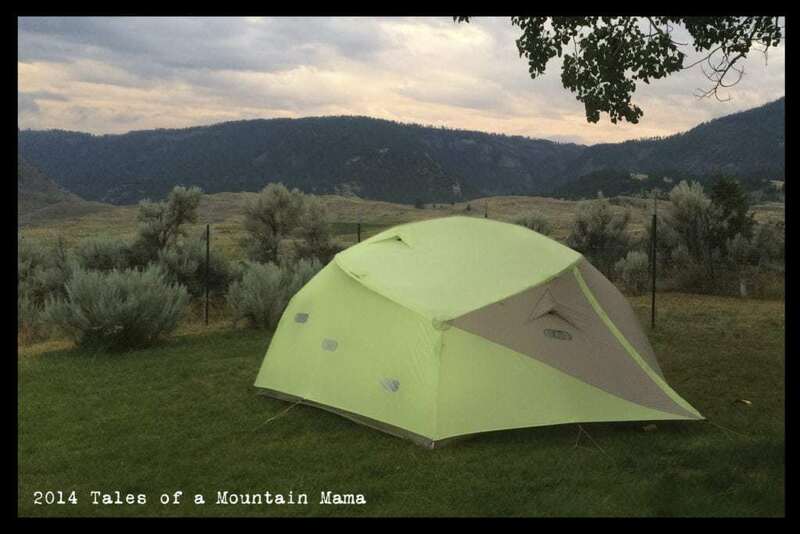 It’s one of my favorite pieces of outdoor gear for kids for it’s versatility, practicality, and durability. 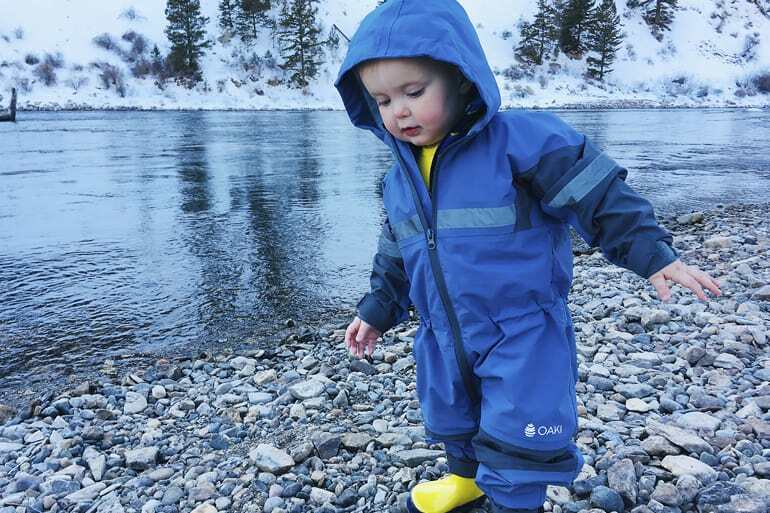 The trail suit is made for keeping your little one dry while puddle stomping, playing on wet playgrounds, or sitting in the mud. I’ve used trail suits with my older two children and while I do need to re-waterproof them, they have held up amazingly well over several years of use and abuse. My one year old put one to the test, and I am loving it for her as well. The one-piece suits cinch down amazingly well (she is wearing a 2T at 17 months old), so you can get several years use if you order up a size or even two. There is even a cinch at the waist, which helps reduce the bulk when kids are moving and playing. The seams are taped and waterproof for light play. 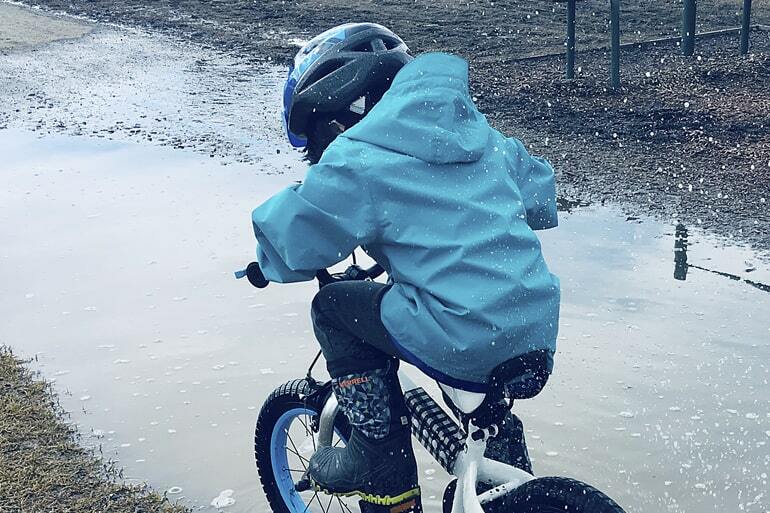 We have noticed that when kids are laying in puddles and playing very hard, they do come home a bit wet, but nothing compared to what they would have been. Plus they will keep the mud off of clothes. My kids typically will come home a bit wet (after sitting in puddles for hours), but not sopping. 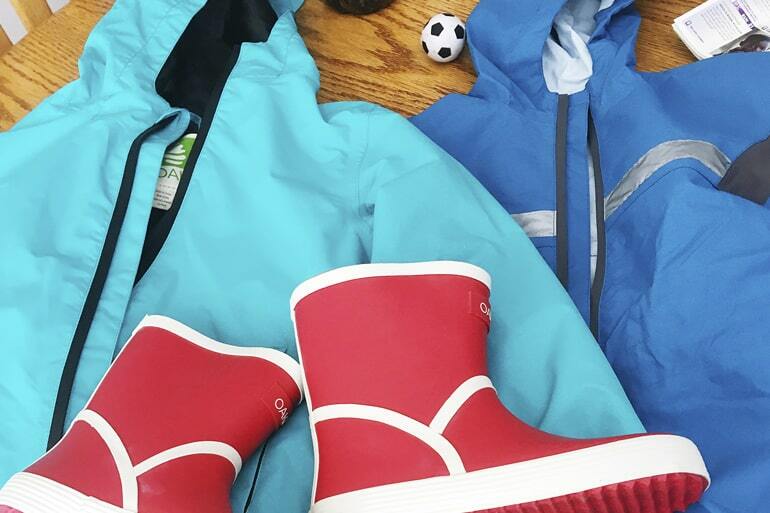 So many uses, from rainy days, to muddy trails, to fully body windbreaker. Cinches down to fit smaller sizes. Seams are taped to keep water out. 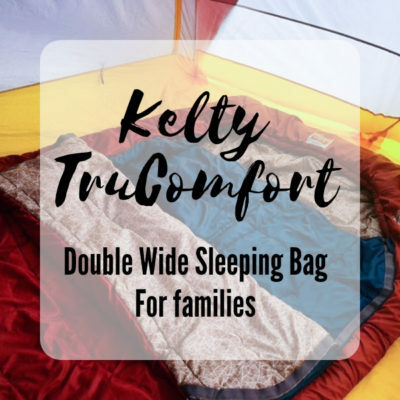 Keeps kids mostly dry, and clothes from getting muddy. Not 100% waterproof for hard, intense play. 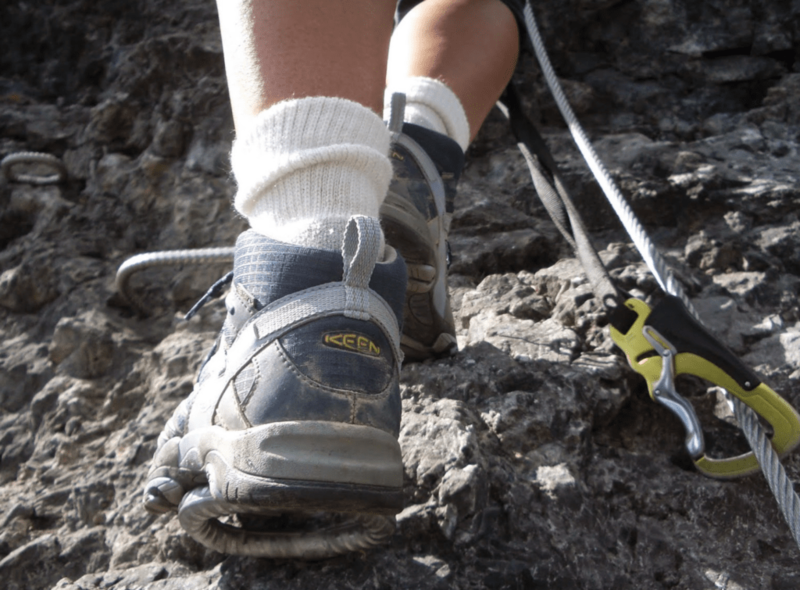 No pockets, which is a problem for kids looking to add to their rock collections (or rather, a problem for the mom who is now carrying the rock home). Playing in the rain and mud. Biking on wet roads – one of our favorite times to wear rain suits, because of how much water gets splashed up onto your legs. My 4 yo put the new Core Rain Jacket to the test. The Core Rain Jacket is a very lightweight (there is no insulating layer) jacket with sealed seems and a silky polyester lining. There is a slight brim on the hood which was handy for keeping sun (and probably rain!) out of the eyes. Disclosure: It did NOT rain the entire time we were testing out this jacket, so we will update once we get to play with it in the rain. 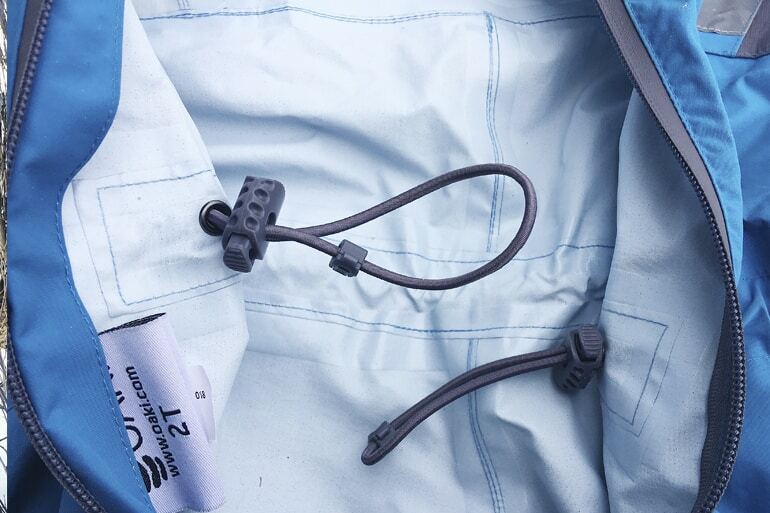 This jacket has a waterproof zipper, as well as two waterproof pockets. My 4 year old rock collector was appreciative of the pockets on this model. 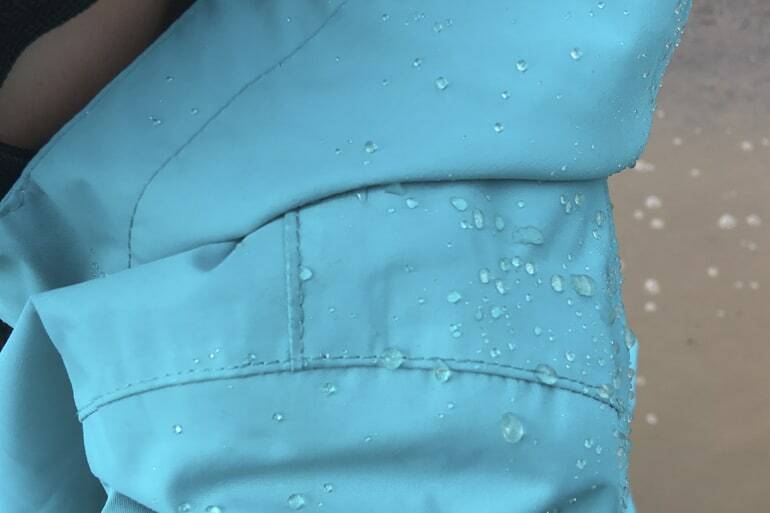 Unlike the trail suit, the rain jacket cannot cinch down. 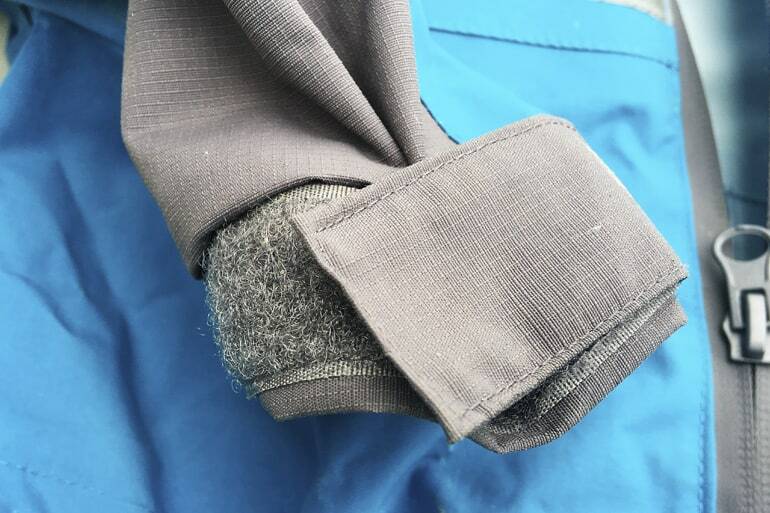 The elastic cuffs on the wrists were mostly sufficient at keeping the sleeves from dropping below his hands, but I did notice that on slightly cold days, he liked being able to tuck his hands up in his sleeves from time to time. This jacket, like most Oaki products I’ve encountered, ran a bit big. My son wears typically wears a 5T, and he has plenty of room to grow in this 4/5. 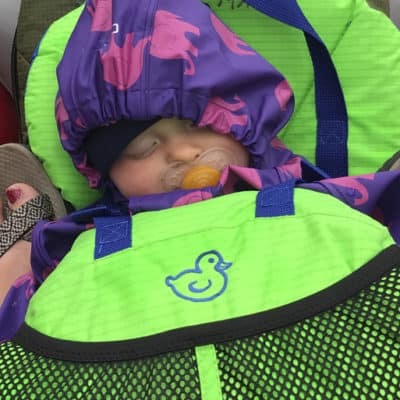 I am a big fan of putting my kids in bright outerwear. Yes, it will show some more stains than dark clothes. 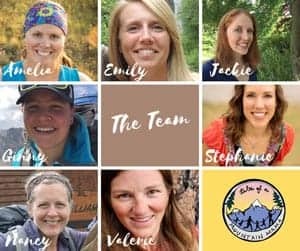 But we’ve realized is it also makes it easier to spot our kids when they get a little ahead of us on the trail or are running around a -busy playground. The Glacier Blue is a unique color and makes him easy to pick out. Afterwards he was still dry. Zippered pockets for storing treasures. Very strong smell when I opened it up. I left it outside to off-gas for a few hours. No ability to cinch the sleeves or waist, although this did not seem to bother my kid. Snow play when it’s too warm for a snow suit. Will update when we try it in the rain! My six year old put the Euro boot to the test. While I thought the minimalist/European style was absolutely darling, he declared that they were “cool.” Ultimately, he dubbed them his “fast boots,” in part because they were so much faster to slip on than his snow boots, and the lightweight made them faster to run in. Because we still have a good amount of snow hanging around, we spent more time testing them in the snow than the rain. The shorter height (they are several inches shorter than a traditional rain boot) meant he was quite often getting snow down his boots. But the trade off for the lighter weight seemed worth it to him. If your goal is to do some serious puddle stomping, you might want to look for a taller boot. 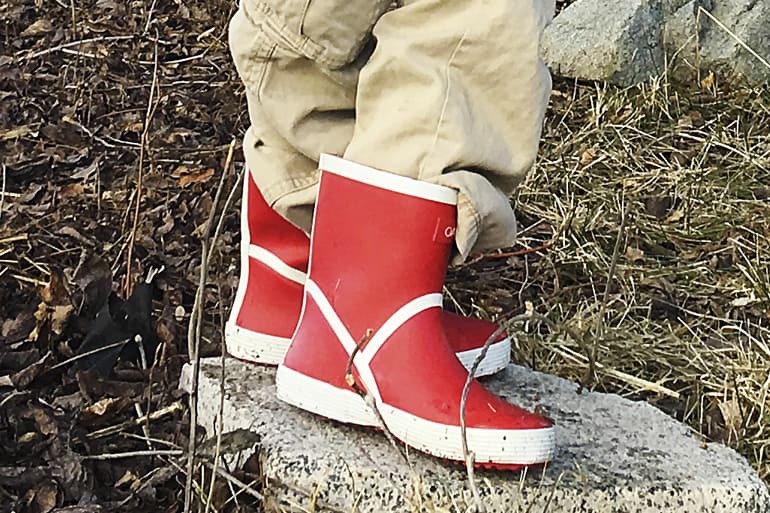 But if you just want something simple to keep feet dry when you are going around town to run errands, or for a quick trip to the playground, these are perfect. My 6 year old even biked in them. The rubber feels like it is a high quality. It’s very soft and not at all stiff. It’s PVC and phthalate free as well. The light weight and low design made running easier for my boy, a big plus when your life-goal is to be the fastest kid on the playground. The shallow tread on the bottom of the shoe looks like it might get worn out easily. We didn’t have any problems with slipping, however, but I will update on how well the tread lasts as we keep using them them. Team Member Jackie is a coffee-lover, writer and a mom of a five year old, three year old and a baby living in Helena, MT. 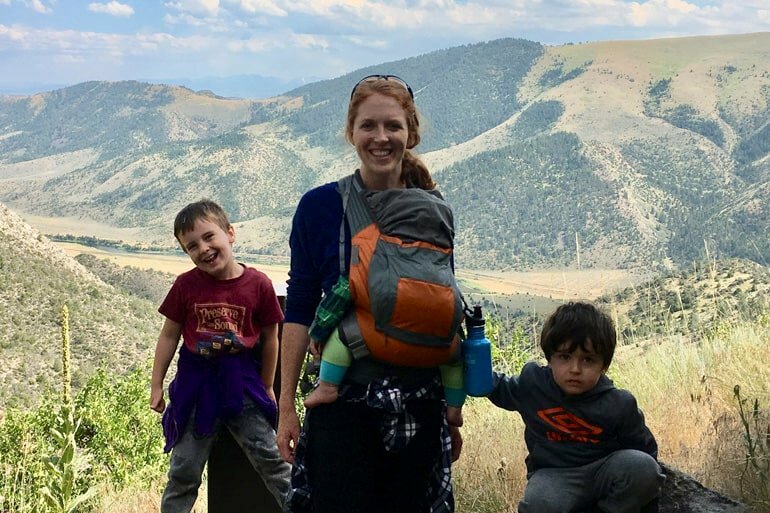 She thought that hiking might help tame her children’s wild spirits, and co-leads a Hike it Baby branch. All that hiking only made her crew wilder, but in a good way. Before kids she enjoyed reading, knitting and baking, but now she enjoys making it to bedtime.